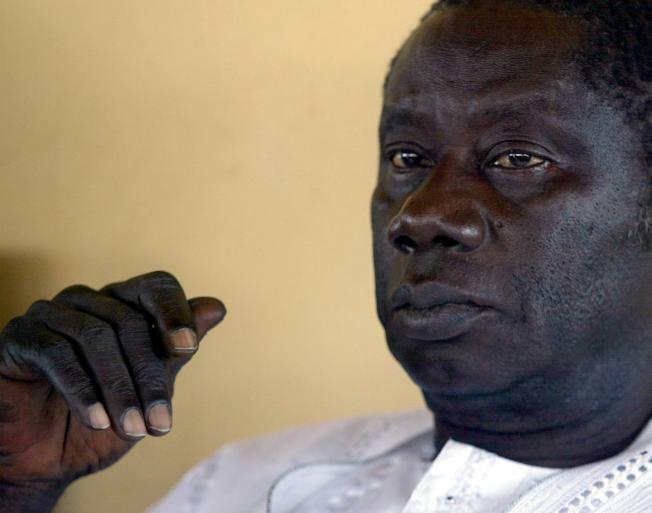 President of Guinea, Guineen Lansana Conte gives a press conference about the rebellion in Liberia, in Sept. 2002 at his Khemaya plantation, north of Conkary. A military-led group declared a coup in the West African nation of Guinea on Tuesday, announcing it had dissolved the government and constitution hours after the death of the country's longtime dictator. The nation of 10 million has been ruled by only two men since it gained independence from France half a century ago. President Lansana Conte, who took power in a military coup after the death of his predecessor in 1984, died Monday night, the country's National Assembly president announced at about 2 a.m.
A uniformed spokesman for a group calling itself the National Council for Democracy began broadcasting its announcement of the takeover at around 7:30 a.m. local time on state-run radio and TV. "The constitution is dissolved," the unidentified spokesman said. "The government is dissolved. The institutions of the republic are dissolved," he went on. "From this moment on, the council is taking charge of the destiny of the Guinean people." He said presidential elections will be organized shortly, but did not elaborate. Six hours earlier, the head of the armed forces had stood at the side of the president of the National Assembly, Aboubacar Sompare, as they broadcast the news of Conte's death. The show of military and government unity gave the impression the military might allow the transfer of power to follow the rule of law, which calls for the head of the National Assembly to be sworn in as the new president. Sompare called on the Supreme Court to follow the constitution and name him president. In addition to the head of the army, he was flanked by numerous officers in military uniform, giving the appearance that the politicians and the military had agreed on a course of action. The joint news conference was not held until 2 a.m. local time Tuesday, hours after Conte reportedly died. Conte was believed to be in his 70s and in poor health. Conte, an authoritarian ruler for 24 years, was the country's second president. He was one of the last members of a dwindling group of so-called African Big Men who came to power by the gun and resisted the democratic tide sweeping the continent. The 1984 coup was carried out a week after the death on March 26, 1984, of President Ahmed Sekou Toure, who had ruled Guinea since the country's independence in 1958. Though Guinea was blessed with fertile land and rich mineral deposits — including half the world's reserves of bauxite, the ore used to make aluminum — its economy has rapidly deteriorated and its people have remained among the poorest in the world. A food exporter at independence, Guinea turned to importing food as it became more impoverished, crippled by corruption, inflation and high unemployment. Conte's unpopularity was reflected in revolts by disgruntled soldiers and at least two attempts to oust him. As a post-Cold War democracy wave swept the continent, Conte formed a political party and won elections in 1993. He was re-elected in 1998 and 2003, but all the elections were viewed as fraudulent and rejected by Guinea's beleaguered opposition. During the last election, rumors of his failing health were already circulating. He was reportedly so ill that he did not even get out of the car to cast his ballot. That winter, he went on TV to put a stop to the rumors of his death. "Everybody dies," he told the nation. "Even the Prophet died. I will die when Allah wants me to." A similar wave of rumors began gathering force two weeks ago, when Conte failed to make his usual televised appearance on the occasion of a major Muslim holiday. The prime minister and others hurried to make appearances in his place, but people were on edge and numerous businesses shuttered their doors in anticipation of unrest. Last week, the editor of a local paper was arrested after publishing a picture of the frail leader struggling to stand up. The newspaper was ordered to print a photograph of Conte, showing him in good health.